May 21, 2013 - Switzerland’s aircraft manufacturer, Pilatus Aircraft unveiled its twin-engine business jet the Pilatus PC-24 today at the European Business Aviation Convention & Exhibition (EBACE) in Geneva. Its price tag is at of 9 million U.S. dollars. The entirely newly developed PC-24 sees traditional Pilatus values of versatility, efficiency and Swiss precision brought together in a business jet for the very first time. This innovative development marks the creation of a new segment in the business aviation market. The PC-24, "Super Versatile Jet" is the first business jet worldwide with the ability to use very short runways, paved or unpaved, and a cargo door as standard. The jet also boasts an enviably spacious cabin which can be configured to individual requirements. With these features, this aircraft is truly a "Super Versatile Jet". Oscar J. Schwenk, Chairman of the Board of Directors of Pilatus said "Over ten years ago, we started asking our PC-12 customers what they would like to see in the next Pilatus aircraft. The answers were always the same, further and faster whilst retaining the much appreciated strengths of the PC-12, such as the ability to use very short runways. It was a huge challenge for our development team! We are all the more proud to be able to unveil an aircraft with exactly those qualities today, the PC-24." 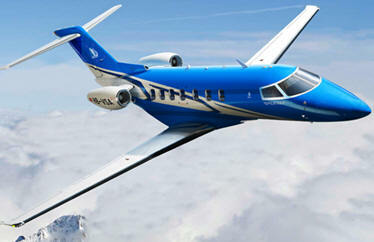 The PC-24 business jet will offer its future owners a combination of performance and versatility. The cabin interior will be available in a wide choice of different configurations ranging from an executive layout with 6-8 passenger seats to a commuter setup with room for up to 10 passengers, or even combi-versions with ample space for passengers and cargo, right through to special installations for emergency medical flights. The PC-24 reaches a maximum speed of 425 knots. The maximum range with 4 passengers is 3,610 km. The PC-24 is powered by two Williams FJ44-4A turbines, each of which produces 15,124 kN of thrust. The avionics system draws on a completely new Pilatus concept, the "Advanced Cockpit Environment" (ACE) system, developed especially to reduce cockpit workloads. Even in the basic version, the "Pilatus ACE" offers four 12 inch screens, the SmartView synthetic vision system, TCAS II, IRS, LVP and the option to complete flight planning procedures on the screen itself, in graphical form. Work on the prototype in Stans is in full swing. The roll-out is scheduled for the third quarter of 2014. The PC-24 will take off on its maiden flight towards the end of 2014. Certification by the European (EASA) and the FAA is planned for early 2017 and the first aircraft will be delivered immediately thereafter. The PC-24 program was approved by the Board of Directors of Pilatus Aircraft Ltd in summer 2012 and is financed entirely from company funds. Schwenk has no doubt that the PC-24 will be just as successful as the PC-12, of which over 1200 models have been sold to date. Schwenk said "importantly, the PC-24 is a completely new development not a 'me too product'. Specifically, there is no other business jet on the market with the same credentials and qualities as our new jet. Once again, we aim to fill a market niche and I am confident we will do so successfully. I am proud that we are able to develop such complex aircraft for the worldwide market here in Switzerland. I am sure our future customers will be every bit as enthusiastic as I am about the PC-24, the world's first 'Super Versatile Jet‘!"